iOS 12 tips and tricks – Hello guys, today I have come back with another great article and in this article, I will show you guys some really awesome iOS 12 tips and tricks that you can do on your iPhone. I’m sure guys that probably a lot of you guys didn’t know existed. so let’s go and have a look at these best iOS 12 tips and tricks. On any text on iOS, you can 3d touch on a word to move it anywhere you want. so if you do 3d touch on the word then that word will be selected and you can go ahead and move that word anywhere you want on the text. so simply 3d touch on the word don’t select it just 3d touch on it and it will move anywhere you want. so basically it will separate it from the other text and you can move it anywhere you want on that text. On the camera app when you bring up the effect then you will have different effects. so if you 3d touch on an effect then it will remove all the other ones and will just leave the selected one and the original. so you can compare it how it looks on the original and how it looks with the effect. so you will have different effects. just fully touch on anyone that you want to compare with the original one and it will show you only those two effects. On the control center, you can 3d touch on the timer and it will show you a slider that allows you to step that timer directly from the control center. so as easy as that just select any amount of time you want to click start and it will start the timer. On the iMessage app on any conversation, you can tap the picture of the contact and then you will have these little icons that say info. if you tap on it then you can go ahead and mute that conversation basically hide the alerts from that conversation click done and then when you go to the list of your conversations then you will see that little moon icon right there, which indicates that conversation is muted. The notes app now allows the scan documents. of course, I’m pretty sure a lot of you guys already know about that. but what you can also do is sign those documents. so if you just go ahead and scan a document then you can go ahead and open that document tap on the up arrow that you will on the right side of the top then go to markup and then just click on the plus button right there and you can add your signature and once you add it then it will save. Using the new screen type feature you can lock any apps on your iPhone with a passcode for up to 23 hours. so if you just want to leave your iPhone somewhere you don’t want anyone to use your apps, what you can do is just go ahead and go to screen time first of all you need of course to set your screen time passcode right there then go to downtime and then what you need to do is just enable it and then you will have the start and the end. So you can set the hours, when it will start and when it will end. so basically once you have done that you can go ahead and go to always allowed. so you will have the absolute that are always allowed and the other ones will lock during downtime. On iOS, do you know that predictive text is really really awesome and it’s a very nice and useful feature. it will basically learn the way you type the way you say things and it will predict them for you. but you can reset that on the keyboard. so you can basically restart your keyboard from point 0 so just go ahead go to settings go to general and then scroll all the way down here to reset and tap reset keyboard dictionary and it will basically delete everything from the memory of the keyboard and you will have it just like you had it the first day that you bought your iPhone. So that is it for this article guys. 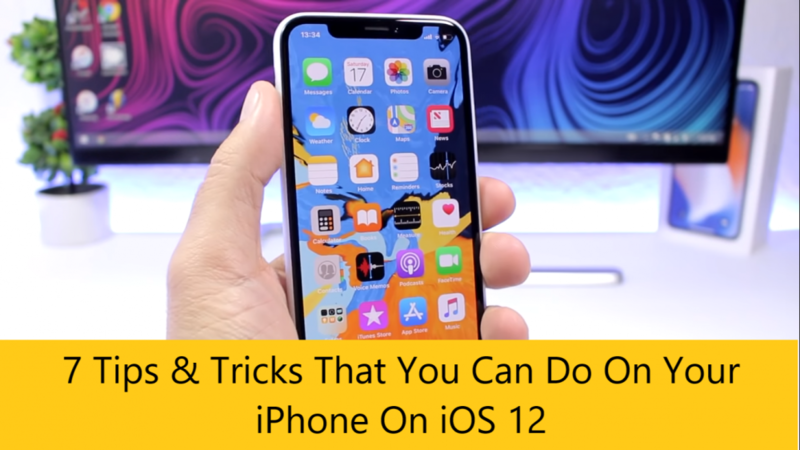 these are some really awesome iOS 12 tips and tricks that you can perform on your iPhone. I’m pretty sure a lot you guys didn’t know existed these iOS 12 tips and tricks. I hope you guys enjoy the article. So if you like this article then please don’t forget to share this with your friends, family members, and on the social media and also visit on this website. because we update here everyday new and helpful articles or you can follow us on our Facebook then you will never miss any upcoming updates. now I’ll see you guys on the next one.